Does Your House Office Carry a True Working Essence? The trend of creating a ‘home office’ is increasing in Pakistan. A home-based workplace serves as a platform to manage your work off hours work more efficiently. You can use this personal working place to do some online work, or complete your pending office work. Even if you are running a personal business, the room can be used to do some important paperwork but this is only possible when it is constructed and designed while keeping the technical and interior designing factors in view. By hiring the services of a construction company in Pakistan, you can get a home office created in an ideal way because the professionals can consider the various factors which a layman cannot think of. “To construct a home office, you need to consider various constructional and interior designing convolutions which are meant to bring a true working essence,” says Amer Adnan, the CEO of Amer Adnan Associates, a famous Pakistani construction company. It all depends on you whether you want to allocate an attic, a basement or a spare bedroom to make a workplace in your house. Along with many other things, you also need to consider the overall space available in your house. A workroom created in an attic provides you privacy, space and an outside view; whereas in a basement, you get a properly separate area with complete working ambiance. Although, a home office needs a peaceful, quiet and calm inside environment but this never means that it should be totally deprived of outside sight. You need to consider all the constructional complexities like – proper entrance of light and air. For the best construction work, you can take the services of an architect in Pakistan. For a more perfect work, you have to take the services of a professional interior designer and architect. This is certainly not as easier because you need to choose the one, who has a good repute and could provide you with the best professional work within your allocated budget. Before hiring an architect or interior designer, check his previous work, experience and punctuality. When it comes to do some office or business task, your productivity depends greatly on the environment you are working in. You can only concentrate when you have a proper working atmosphere that is away from all kinds of distractions. Make the interior, a merely workplace with all accessories and interior related to official work. Choose the paint colors which carry more of a serious and calm feel like, white, off-white and grey. Have a shelf to place your items, and official documents. You need to make a comfortable seating support by placing an office chair or a desk chair that is especially designed to be used at a desk in an office. Mostly the office chair is revolving chair with wheels for easy mobility. Also place a table that has proper pull-in drawers under it. 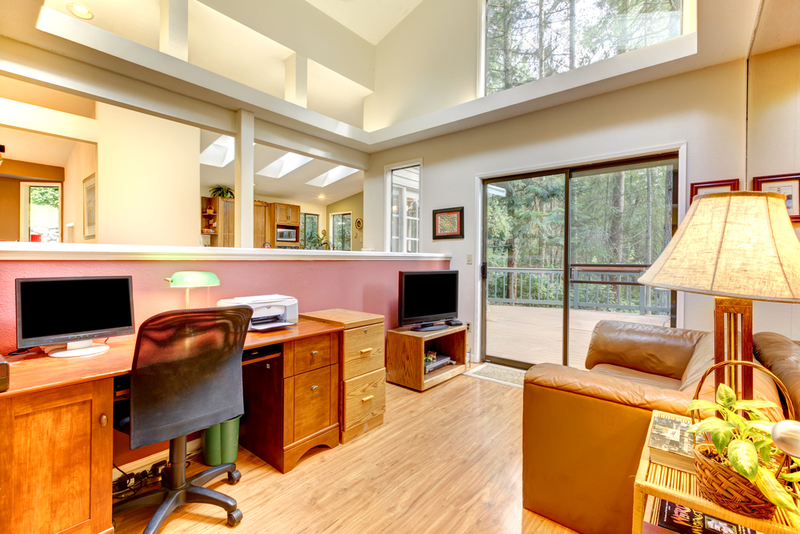 Whatever furniture you choose for your home office, you need to keep the space factor, price and style in view. Be it stationary, furniture, computer or a printer, you need to make sure that you have all necessary items placed in your room. If you have a single door of your workplace that opens directly to your house inside such as living room, hallway or any other place, it may disturb and interrupt the office feel of your room. Therefore, the better option is to use two doors with one opening inside area of your house whereas the other directly outside or into your lawn. To make an ideal workstation at your home, you can hire an interior designer, who could provide you with the best work, within your allocated time and budget.